Some of my fondest memories from decades of diving have come since I started diving with my own daughters. Diving has been deeply ingrained into my life. There was never any doubt that when my own children got old enough, my wife and I would introduce them to the sport. As toddlers, my daughters learned about scuba gear from “helping” me rinse my gear after a day of diving. I showed them my underwater photos and we took them on trips to local marine aquariums and to the beach, where they learned about sea life. We also started them in swimming lessons when they were very young. They took to the water like little fishies, diving for pennies in the pool. I’ve been diving long enough to watch the sport evolve from an adventure reserved for the brave and hardy to one that can be enjoyed by the whole family. Advances in equipment and training, along with shifting attitudes, have made this possible. Scuba gear sized for children and teens is readily available, and kid-oriented training programs with names like Bubblemakers, Future Buddies, Scuba Rangers and Seal Team are offered by practically every recreational scuba certification agency. What’s more, you’ll find that family-themed travel is now offered at resorts and on live-aboards worldwide. 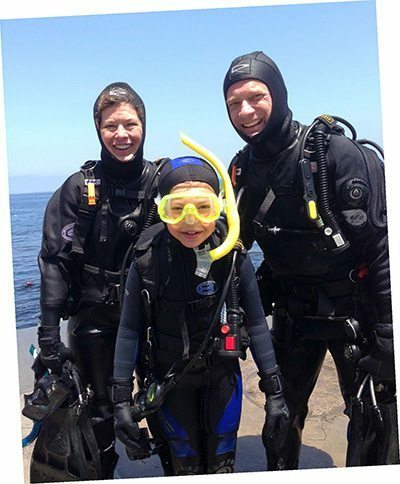 If you’re new to the sport or you’ve not yet considered scuba diving as multigenerational, perhaps it’s time to take a closer look at how our sport can be perfect for everyone — kids, parents and grandparents, too. It’s a good idea to start kids off with ocean-themed education and entertainment from a very early age. There’s no shortage of material available, from “Finding Nemo” to Sponge-Bob Squarepants, to books and interactive apps that will spark kids’ desire to learn about undersea life. You can add fuel by arranging visits to marine aquariums, most of which have hands-on exhibits that let kids actually see up close, learn about and touch various marine life specimens under the supervision of aquarium staffers who are trained to educate kids. During the summer months, many aquariums even offer special “camp” experiences, ranging from aquarium “sleepovers” that allow families to spend the night in the exhibits, to field trips that take kids out to experience various environments. It’s also great to take the kids along on your local dive trips. It might take some extra effort (and a topside sitter), but there’s no better way to introduce the kids to the sport you love than by taking them along. Perhaps the most important component of getting the whole family scuba-ready is your relationship with a dive center and instructor. Again, because of the popularity of kids’ programs, virtually every major scuba training organization offers some type of program aimed at introducing children to scuba diving. However, some stores and instructors are more adult or tech oriented than kid-friendly, so it pays to seek out those who specialize in training younger kids and families. When you establish a rapport with an instructor that teaches young ones, it’s likely they can help you assess your child or grandchild’s readiness for scuba training, and suggest the type of entry-level program that’s right for their age and development. Did I mention that scuba programs especially for kids are very popular? A quick Google search of “kids’ scuba programs” revealed more than 5 million results. Each program is broken down by certain parameters, such as minimum age, depth limit, skills taught and supervision requirements. These are pool- or confined-water-based “try scuba” programs geared toward kids 8 and older. Not certification programs, they typically involve brief introduction to the equipment and how to use it, and while under direct supervision by an instructor the child gears up and is allowed to breathe from a scuba regulator and experience scuba diving. Depending upon the program, the depth limit ranges from six to 12 feet (1.8 to 3.6 m). Some dive centers even offer these types of experience-based programs as birthday parties. Kids that enjoy their initial “try scuba” experience will surely want to do it again. More comprehensive, ongoing experience programs usually involving six to eight sessions are also available. These programs are usually offered as a series of “mission-oriented” underwater activities, which might include photography, navigation and environmental awareness. Some include field trips and a variety of classroom and topside activities. At least one scuba training agency offers a snorkeling class geared toward ages 5 and older, providing young children with the basics of how to use a mask, fins and snorkel in the pool. In general, to become certified as a Junior Open Water Diver, participants ages 10-14 must complete all the requirements for Open Water Diver certification. There is no difference in the course material or watermanship requirements. However, restrictions apply. For instance, until the diver reaches age 15, he or she must dive under the direct supervision of a certified instructor and/or a certified parent or guardian. In addition, the diver must remain above a depth of 40 feet (12 m). Other certification courses, including advanced diving, rescue diving and certain specialties, are offered to youngsters who hold Junior Open Water Diver c-cards. Once the diver reaches 15, he or she can upgrade to an Open Water Diver certification card without needing to take an additional course. I’ve been diving long enough to watch the sport evolve from an adventure reserved for the brave and hardy to one that can be enjoyed by the whole family. No one knows your child better than you do. That said, when assessing their physical and emotional readiness to start scuba lessons it’s a good idea to ask for feedback from professionals, such as your pediatrician, teachers and those who instruct your child in activities like dance class or karate lessons. Their input, along with that of a scuba professional, can be very beneficial. Most importantly, your child should possess a keen interest in learning to dive. No matter how much you might love diving, there’s no guarantee that your kids (or spouse or anybody else, for that matter) will love it just because you do. If your child is reluctant, don’t force the issue. Encourage and invite, but don’t cross the line by insisting. A child who says “no way” now might change his or her mind in a short while, but making scuba lessons compulsory may likely turn them off to the sport instead of into an avid diver. When you mention scuba diving to nondivers, it’s not uncommon to hear them ask, “Isn’t it dangerous?” It’s not surprising that nondiving family members or friends might express concern when you mention that you’re readying your child or grandchild for scuba lessons. Scuba diving is not without risk, but is actually far safer than everyday activities kids engage in, such as bicycling or skateboarding, which are to blame for the majority of head injuries in children. To put it in perspective, according to statistics provided by National SAFE KIDS Campaign and the American Academy of Pediatrics, in the United States about 30 million children and teens participate in some form of organized sports. More than 3.5 million injuries are reported per year, with more than 775,000 children ages 14 and younger being treated in hospital emergency rooms for sports-related injuries each year. According to these and other statistics, kids are safer in a scuba program than they are on a soccer field. Outfitting your younger diver with properly fitting equipment is critical to their safety and enjoyment. Your local dive shop can help you select kid-sized scuba gear and exposure protection. Gone are the days when dive equipment was available in only one size (large) and one color (black) built to fit adult males. Scuba equipment manufacturers have enthusiastically responded to the increase in women, children and teens entering the sport, making it easy to shop for diving equipment and accessories in a wide range of sizes. One important piece of advice I’d like to offer is this: Skip the “starter” snorkel kit available at your local big-box store in favor of a dedicated dive mask, snorkel and fins. Visit your local dive center and ask them to help your child or grandchild select a mask that properly fits their face. You might pay a little more, but trust me, it’s worth it to see your kid start out with a mask that fits well and a snorkel that’s designed to clear easily. When it comes to selecting fins, open-heel fins with adjustable straps, worn with booties, might accommodate a growing body more readily than full-foot styles. Here again, your scuba retailer can assist. Exposure protection is also important. Even if your kid is only taking part in a pool-based scuba program, a light wet suit top or shorty will add to their overall comfort and enjoyment. Smaller, lighter second-stage regulators are available, too. If the standard mouthpiece isn’t a good fit, opt for a smaller size. Today’s buoyancy compensators (BC’s) typically range in size from XS to XXL and larger, and have multiple adjustment points for a truly custom fit. Even scuba cylinders can be obtained in smaller sizes perfect for the younger set, so there’s no need for smaller divers to struggle with gear that is oversized or doesn’t offer a proper fit. When diving with a young person who has a Junior Open Water Diver c-card, keep in mind that the certification comes with restrictions. Make sure you understand and adhere to them, for everyone’s safety. A younger diver, even a well-trained one, may not be physically able to aid an adult in an emergency situation. For this reason it’s good to have two adult buddies paired up with each junior diver. Keep this in mind when planning family dive outings. No one likes to admit to being a “helicopter parent” — one who hovers over his or her child, intervening (or interfering) in an attempt to prevent a kid from getting the slightest bump or bruise. After all, we want to do everything we can to keep our children safe. But believe me, sometimes the best thing we can do for our child is to allow them to learn and grow with minimal intervention. This might mean that you remain on shore, entrusting your child’s safety to a trained scuba professional during those initial certification dives and maybe even for their first few dives after certification. Discuss this with the certifying instructor. He or she can provide tips that will help you balance your dual roles of parent and dive buddy. Training agencies and manufacturers aren’t the only ones making it easier for kids and teens to enjoy scuba diving with their families. Resorts and live-aboard boats all over the globe offer a wide variety of family-friendly travel options. In some instances, special “Family Week” programs are offered exclusively to families traveling with children. In addition to accommodations and diving, families enjoy special activities such as arts and crafts, field trips, special dinners and sunset cruises. 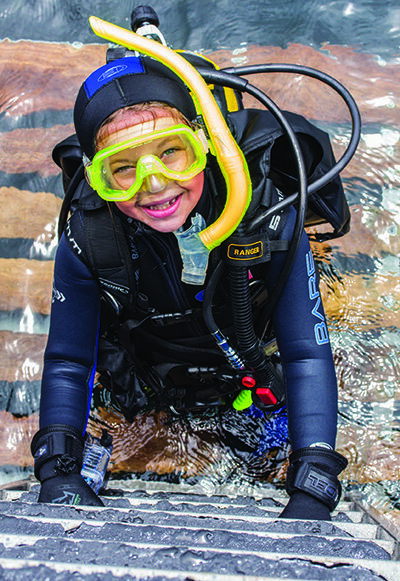 Young divers are often offered the chance to enroll in specialty courses, take an underwater photo class, or learn maritime skills such as knot tying and basic boat handling. Evening activities designed just for kids offer parents the chance to enjoy a quiet dinner together, or go for a stroll on the beach. Other extras, such as babysitting, are also routinely offered. Even close-knit families sometimes enjoy time spent apart. This is when a special scuba camp is ideal for young teens that are mature enough to spend a week or two away from home — maybe on a boat in the tropics — learning about scuba diving, sailing and marine life. A variety of programs are offered in the United States and abroad. And while the kids are away at scuba camp, mom and dad can enjoy the “no kid zone” at home. As a diver who’s been passionate about the sport for many years, I didn’t think I could enjoy it any more than I already do. But honestly, my love of the sport ratcheted up several notches when our daughters got certified and started joining my wife and me on dive trips. One more word of advice: Be prepared to “dial down” your diving to suit the skill level and stamina of your young buddy when he or she is just starting out. At the same time, be prepared to enjoy the wonder and awe of their first dives. One thing any experienced diver learns over time is that no matter how long you’ve been diving, you’ve never seen it all. Diving West Coast kelp forests, I’ve found and photographed the California moray eel and the two-spot octopus many times. These two creatures are commonly seen on dives and are known to be mortal enemies, but actually observing their interaction is rare. Imagine my surprise when my 10-year-old daughter, after finishing her 10th ocean dive with my wife, shared her experience of witnessing a fight between a two-spot octopus and a moray eel. Her excited description of the battle, and how the octopus managed to escape in a cloud of ink, proved to me that she was enjoying the sport just as we’d hoped she might. In addition to providing an enjoyable family adventure, our scuba outings serve as a living classroom, too. My younger daughter had a similar lesson in predation during a dive when she discovered a small octopus out in the open. She was delighted as she watched it shift colors as it made its way across the rocks. That’s when a sea lion spotted the octopus, eyeing it as a snack. She watched as the sea lion closed in, and later reported that she was especially glad to see the octopus slip into a crack before the sea lion could catch it. Sure, she could have watched this behavior on a nature documentary or YouTube clip, but to have the real-life experience in the ocean, and share it with us, was priceless. 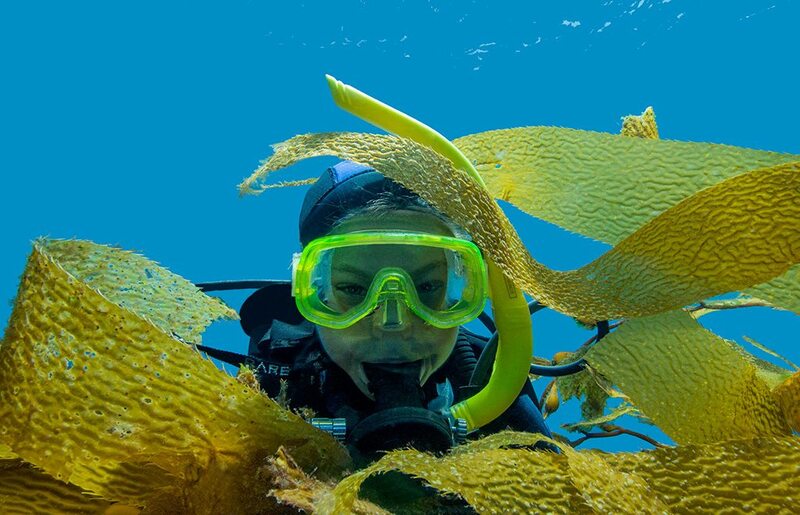 In cool California waters my daughters have been diving alongside 300-pound (135 kg) black sea bass, 4-foot (1.2 m) wide bat rays, and a tiny red octopus that was no bigger than a golf ball. In tropical waters they’ve been fascinated to witness a cleaner shrimp pick the dead skin off a diver’s fingers, watch a sea turtle graze, and see a conch’s eyes peer out from under a shell. 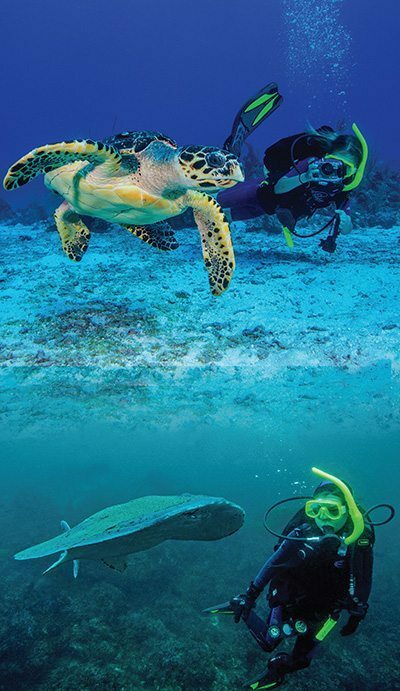 To experienced divers, these experiences might seem common or even routine, but to a young kid, even the commonplace can appear magical. When we share our scuba experiences with our kids, we’re not only teaching them about the sport of scuba diving and the environments that we treasure, we’re also creating memories that will last a lifetime.